Jana Foods, LLC is an importer of fine cheeses, based in Iselin, NJ. Starting out as a small cheese import and export company over 20 years ago, the company has grown to become a real player in the specialty foods marketplace. 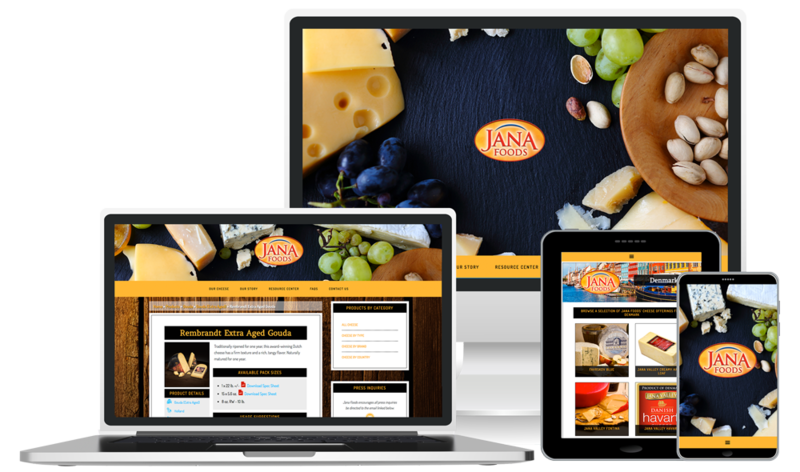 With that in mind, they partnered with Fake Plastic Websites in early 2016 with the goal of fully redesigning and developing their website at janafoods.com to more accurately represent how far their business has come. The new and improved janafoods.com did just that. The mobile friendly site now allows users to find cheese by type, origin and brand and provides extensive information to assist retailers and foodservice professionals including product recipes, pack size specifications, usage suggestions and wine and beer pairings. The clean and user-friendly online portal where customers and trade partners can fully explore its extensive selection of global cheese imports.